This statement is a pronouncement of Author Dr. Seward’s profound philosophy of life appropriately mentioned in the preface of Patient Care: Death and Life in the Emergency Room. Very few people can fathom the innate power and sheer emotional and physical weight of having another person’s life in their hands. Struggling with split second decisions in the emergency room can affect many lives in the blink of an eye. As a respected physician for over 50 years, Dr. Seward regales the reader with slice-of-life vignettes that both illustrate and educate us about myriad aspects of medicine including both the physical and emotional ones. Not only is each case a bit different but there are often unusual complexities involved no matter how routine a set of symptoms appears to be. For example, a 42-year-old man arrived at the E.R. wanting help for alcoholism. During the intake with the patient while gathering a history of drinking behavior, his hands began to shake and he began sweating profusely. It was apparent to the trained eye that this patient was suffering with severe D.T.’s (otherwise known as delirium tremens, a consequence of alcohol withdrawal that can lead to death). This required the doctor to perform a procedure called “rapid sequence intubation” which involved placing a tube in the patient’s windpipe in order for him to breathe. While reading the details of each case, especially for those readers who are unfamiliar with emergency medical procedures, some might feel a dramatic ascent similar to a roller coaster ride with an unpredictable crash or in the best case scenario, a leveling off to normalcy. We are strategically placed as an observer in the room while life-saving procedures are being applied. One can not only visualize the patient’s physical reactions, but there are times when one can feel his fear or anxiety as well. Patient Care: Death and Life in the Emergency Room is an unusual memoir readers will not forget. If one is unfamiliar with emergency medicine, it will be an educational experience told with enough real-life drama to keep one interested and may further an interest in the field. Some readers, however, may perceive a drawback in the book. 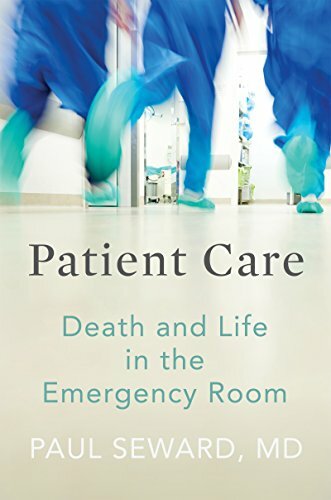 At just over 220 pages, the brevity of Patient Care: Death and Life in the Emergency Room can be viewed as a bit disappointing. There must be so many more fascinating stories to include in a book such as this one, particularly when they are told so well.